The gun control debate is an old one. One that has been talked about every time there has been a school shooting. There has been many different types of opinions stirring around and I wanted to give my two cents on the entire debate. Honestly, I have spent a good amount of time listening to both sides and what is the logical reasoning that causes them to think in that manner. Both on left and right view politics appeared to be different solutions to the same problem. But which is right? Which one should we go with? I wanted to review some of the pros and cons to each item in the debate according to myself. Why is my opinion valueable? Because I do not find myself identifying with Democrats or Republicans. Sometimes having an outside view to the entire debate can help shed some light. Pro: With removal of more dangerous weapons, there comes the potential that there will be less dangerous guns to harm individuals. Con: Removal of individual freedom. Potential to create a black market. Authors Note: Anything you make illegal makes a black market for that. We know this through drug prohibition that when you make an object illegal (whatever it may be) will inadvertently create black markets if you do not reduce the demand. Unless you reduce the demand as well as reduce the supply, the black market will come. Question is, how dangerous do you think a black market based on guns if we already see the problems of a black market for drugs create catastrophic amount of lives lost in the name of authoritarian principles. Hold the gun industry accountable for their marketing of guns. Pro: With removal of advertising of guns, creates the possible potential of removing demand. Con: Regulation to removal of individual freedoms. Businesses suffer economically. Authors Note: The issue at hand is that there are people who 'want' to kill. In my opinion, to reduce killing, we need to come to the root of the cause of why they kill. Attacking the gun industry or gun manufacturers is definitely not the way. Especially considering that the gun stores and manufacturers are already under heavy scrutiny. Despite all the regulation they face today, there are still shootings. Pro: Potential to remove guns voluntarily to the government could help spur the economy while removing guns from the streets. Con: Disarming innocent civilians. Potential to create a tyrannical government. Doesn't actually stop killings. Authors Note: What we've seen in Australia when they created a government buyback program was that it did not work in Australia. 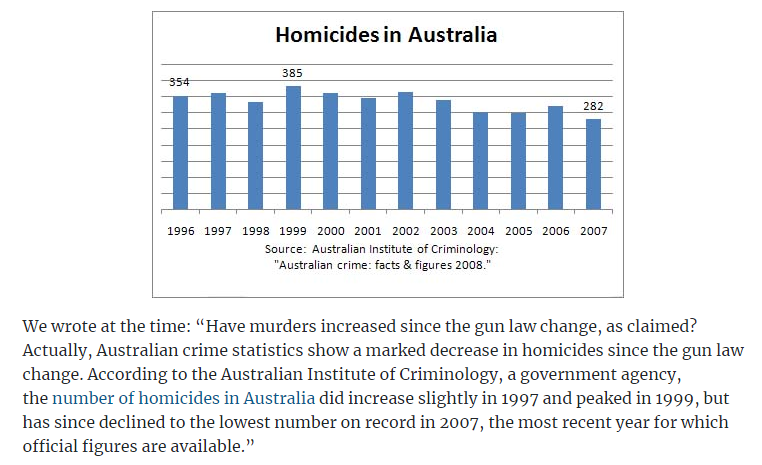 A majority of people in Australia did not give away their guns to the government and violence didn't reduce. While I don't have a dog in this fight regarding gun control, I will say that your comment on the Australian gun buyback is simply false. You stated: What we've seen in Australia when they created a government buyback program was that it did not work in Australia. A majority of people in Australia did not give away their guns to the government and violence didn't reduce. Actually, the number of households with guns dropped by 50%. Firearm suicide rates dropped by 80% with no significant increase in non-firearm death rates. The effect on firearm homicides is of similar magnitude but is less precise [somewhere between 35% and 50%]. I thought it was important to include opposing statements in my initial argument, as well as post proof posted by the Australian Institute of Criminology facts and figures on 'homocides'. Not gun homocides. Creation of TSA-like situations in the schools. Pro: Guns can't enter. Guns can't leave. High potential to stop school shootings. Con: Searches to all students every day. Kids born into a world of high security and high stress. Authors Note: I can only imagine what our issues are with the TSA and post 9-11. We created a monster. We desperately wanted airport security and we got it thanks to government intervention. It then spawned a very annoying series of steps to being able to board a plane. Did it fix the issue? Well take the story of "Man Says He Walk Past Airport Security Onto Flight to Stop Girlfriend." This gentleman, Damarias Cockerman, managed to walk past all TSA security check points just to get onto a jet to yell at his girlfriend. Does the extra security stop shootings? No. People will slip through the cracks and the evils of having children be searched every day is a barbaric, costly, and a devastating way to address the issue. Require license, insurance, and a title. Pro: Stops maniacs from being able to purchase weapons. 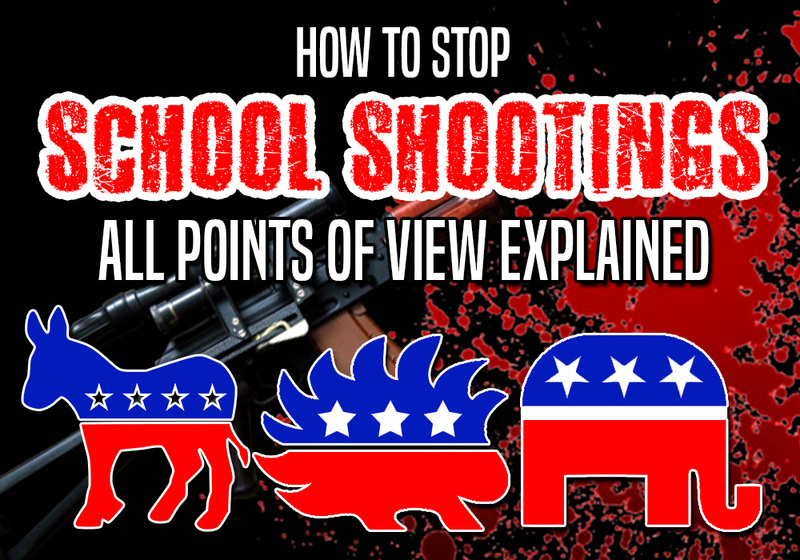 Potential to stop school shootings. Con: May not stop shootings as people who are crazy will find a way to enact their fantasies. Doesn't stop demand. Authors Note: As of now you currently do have to pass a background check in order to purchase a gun. You can go to a gun show, a store, the flea market, whatever. All of which will ask to pass a background check in order to purchase a gun. This is highlighted by the YouTube Video: "HIDDEN CAM: "Gun Show Loophole" Exposed!" which shows that there is no way to pass a background check. Insurance is an interesting one, but to think that insurance would stop shootings still doesn't reduce the demand. Pro: Stops a shooter right then and there. Potential to stop a shooter. Con: A teacher could shoot a student. Authors Note: To me this seems a bit crazy to make a teacher carry a gun around to protect their kids. Do you remember your teachers when you were little? Were all of them mentally sound? Did any of them seem like: "I probably don't want to have Mr./Mrs. Smith carry a gun around because he/she's already crazy enough as it is." We can't assume that the teacher is of sound mind and that when push comes to shove they will be trained to neutralize an enemy. Get people more educated about guns. Pro: People know about guns, then they know what should be regulated. Authors Note: Nice thought. While most people seem to have difficulty understanding caliber rounds as well as whether something is automatic or semi-automatic, it doesn't stop the school shooting. Pro: Potential to stop school shootings. Con: Creation of a black market. People will find other methods of retaliation. Authors Note: This again doesn't resolve the issue. We want to create a world where there are less shootings. When you create a regulation for the gun, you still didn't reduce the demand for someone wanting death and destruction. So if you remove the ability to use a gun what's to say a kid can't grab some ammonia and bleach to throw into a classroom? (Creates mustard gas) To reduce the violence we have to stop the root of the issue. Mandatory background checks. No guns for felons. Mandatory mental health check. Pro: Potential to keep responsible people armed and irresponsible people to not be able to. Con: Removal of potential freedoms. Already have background checks. Authors Note: We already have mandatory background checks. Felons already cannot buy a gun. And you do recieve a mandatory health check as a part of the background check. With that being said, school shootings still happen. Regulating the industry is not the answer as said in previous statements. Pro: Potential to stop the root of why someone wants to kill innocents. Con: Potential removal of individual freedoms of pharmaceutical industry as well as creation of black market. Authors Note: Anything you make illegal it turns into a black market. So if you make a regulation on the pharmaceutical industry it increases the price of the substance. Though with that being said, Xanax (the first antidepressant) was created in 1985. 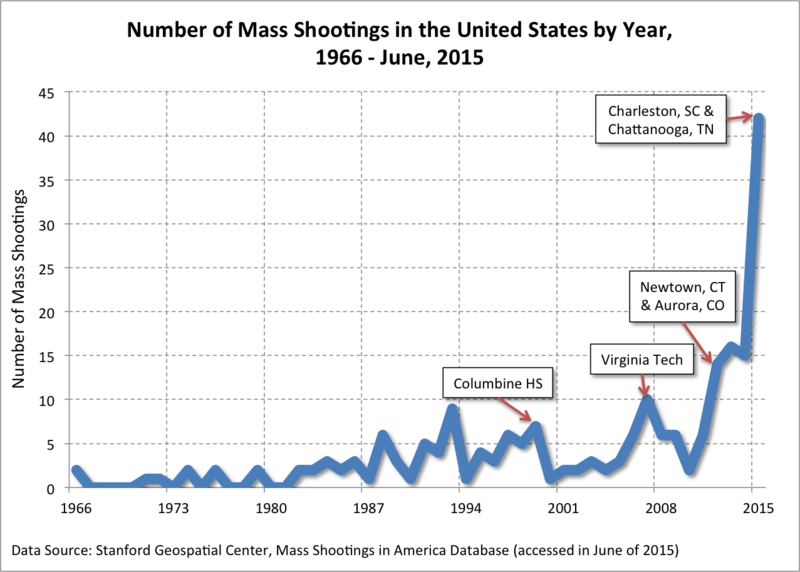 School shootings didn't become more common until 1985. Though causation is not the same as correlation. We need studies to prove if this is happening. With pharmaceutical industries filling the pockets of Uncle Sam, there is a high doubt that it will be mentioned in any news source. Pro: Shooters lose desire to shoot as they now know they will not be recieving any infamy for their actions. Con: Regulation of free speech. Authors Note: I am a very huge proponent to free speech. There does come a few things to note when performing your free speech rights. While this site allows for free speech entirely, there does come a bit of responsibility for journalists and the news agency to not post shooter's names and faces. I think this would have a drastic reduction in shootings. While I do not think that the government should force this, there should be a community effort to talk with the news stations. Please STOP posting the names and pictures of the shooters. A simple fix that doesn't require regulation to make happen. I think we need to have light-touch approach to shootings. I think we also need to make sure we are reducing the 'demand' to why someone would be a shooter in the first place, not removal of individual freedoms. Remove the positive effects of being that shooter and also create environments for parents to watch and take care of their kids. We can't stop 100% of shootings but we can surely reduce it. My favorite method to stop the shootings? The libertarian ways listed above. The modern school system is broken beyond repair. We’re lucky shooting up the place is all those kid do. 10/10 post bro would read again. National socialism is the answer tbh.